Here at Learn Bonds we strive to make the process of choosing a bond fund easy. 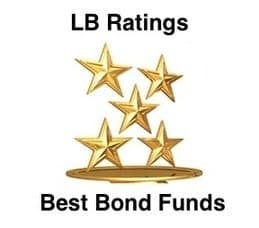 That’s why we released our LB Ratings program, which gives you our thoughts on the best bond funds from each of 5 categories. Below is our list of the best municipal bond funds for 2013 and beyond. These funds are all available at TD Ameritrade. The Vanguard High Yield Tax Exempt Bond Fund (Ticker: VWALX). You are probably surprised to see a fund with “high yield” in its name on our best municipal bond funds for 2013 list. While the Vanguard High Yield Tax Exempt fund is a bit riskier than the average municipal bond fund, it is a lot less risky than the average high yield municipal bond fund. So we think of the fund really as an Intermediate term municipal bond fund, and not as a high yield municipal bond fund. What do we like about this fund? First and foremost it is from our favorite fund management company, Vanguard. Like all Vanguard funds, this municipal bond fund comes with no load fees and a much lower than average expense ratio. If you have $50,000 to invest then your total yearly expenses are just .12%. If you have less than $50,000, it bumps up to a still very manageable .20%. The fund has significantly outperformed the average intermediate term municipal bond fund over both the short and the long term. It also currently yields a full percentage point more than Vanguard’s investment grade version of the fund as well. To see our full rating report on the Vanguard High Yield Tax Exempt Bond Fund go here. Vanguard Limited Term Tax Exempt Fund (Ticker: VMLUX). The average short term municipal bond fund currently yields under 1%. As many bond funds have a front end load and average annual fees of above .5%, that doesn’t leave much room before your returns after fees are negative. This is where Vanguard’s reputation for low fees really shines. Our best municipal bond funds for 2013 winner comes with an annual expense ratio of only .12% for investors with $50,000 or more to invest. If you have less than $50,000 to invest then the fee is still manageable at .2%. The Vanguard Limited Term Tax Exempt fund takes a bit more interest rate risk than the average short term municipal bond fund. However it also takes a bit less credit risk, a nice balance which has lead to this fund’s outperformance over the long term. To read our full rating report on the Vanguard Limited Term Tax Exempt Fund go here. The Delaware National High Yield Municipal Bond Fund (Ticker: DVHIX). If you do a google search for “Delaware National High Yield Municipal Bond Fund” you will likely think that we have committed an LB Ratings mortal sin by recommending this fund in our best municipal bond funds for 2013 list. The reason why is that 2 of the fund’s three share classes carry a hefty 4.5% front end load. Lucky for us however, Delaware Investments released an institutional share class of the fund in 2008. The institutional share class has a .6% expense ratio and no load. Normally institutional share classes require a hefty initial minimum. However, as with many funds, you can access the institutional share class through fidelity with a $2500 minimum. You get the second best performing high yield municipal bond fund over the last 5 and 10 year periods. What else do you get? The same fund manager that produced those returns, who unlike larger funds, still has plenty of flexibility with only $500 Million under management. You can read our full rating report on the Delaware National High Yield Municipal Bond Fund DVHIX here.